Haunted Houses in Denver, Colorado are some of the scariest haunted houses in America. 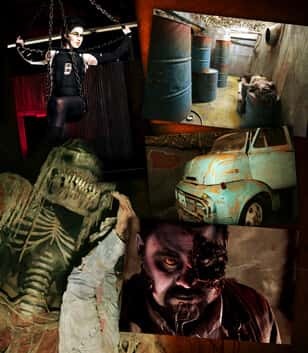 Hauntworld.com tries to review only the best haunted houses in Denver, Colorado. When you are looking for simply the best, scariest, haunted houses in Colorado there is no other place to search than Hauntworld.com which offers our guests the best information to find Colorado Haunted Houses including the best haunted attractions in Denver, Colorado. There are many haunted houses in Denver that claim to the best haunted attraction but only one can truly lay claim to the being the scariest haunted house in Colorado... 13th Floor & The Asylum Haunted Houses in Denver, Colorado. The years passed, Chris and Warren grew up (of course they’ll tell you they never did) and both started different careers. Warren graduated from the University of Northern Colorado with a degree in marketing, and went to work for a high-end appliance company. Chris attended Colorado Christian University and then the University of Colorado and pursued a career in sales and management, first with his mother’s skin care company, then with a microbrewery and ultimately with a large bank. Chris jokes, “I’ve always made a living based on building relationships and selling something, whether it’s beer, money or haunted house tickets.” In addition to their 9-5 gigs, the entrepreneurial bug also bit both Chris and Warren. Warren started Northern Lights, a searchlight and event lighting company. Chris started Innovative Food Services, a contract concessionaire with Six Flags theme parks. It was just natural that one day they would combine their passion for haunting with their entrepreneurial spirit, and start their own haunted attraction. The plan for their first haunted house was hatched in 2001, on a barn roof at the haunted house they were working at, under interesting circumstances. “Chris told me that he wouldn’t be coming back to the haunted house the next season” says Warren. “Yeah, I hated to tell him that, but the time had come to move on, I was just too busy with other things, my career, my family, I really loved working at the haunt, but something had to give,” adds Chris. That night he told Warren that should the opportunity ever come up, that they could work together again, in their own haunted house, to let him know. No more than 3 months later Warren called Chris and said, “You’re not going to believe this.” The opportunity was in front of them, and in October of 2002 Chris and Warren opened their first haunted house, the haunt that would eventually become The Asylum. It was also in 2002, before the season was even half over, that they began planning for their next haunted house, 13th Floor Haunted House. Warren remembers, “It was weird, we had just opened for business, but we were already planning ahead for our next attraction.” “We actually filed our trademark application, registered our domain name, and began promoting to everyone who came through the haunted house by passing out flyers, encouraging them to visit the web site.” “I think there’s power in seeing something and committing it to reality right away. Too often, people have ideas of things they’d like to do, but they never do it” adds Chris. In 2003, they moved to the family entertainment center and began learning a whole new method of haunting. “They had no room for us,” says Warren. “They thought they did, but they really had no idea of the scope of what we needed to build.” They ended up building the attraction under several special event tents, which brought another learning experience. “One of the first questions we asked the fire district was, 'Are we going to need a sprinkler system? The person I spoke with said, 'I’m not aware of any type of sprinkler system for that application, so I don’t see how I could require you to have one." They proceeded to place an order for a single large special event structure, and then 3 days before their meeting with the city planning commission, they received a phone call. The fire prevention engineer told them, “I did a little more looking at the code and although I’m not familiar with any way that you can do a sprinkler system, I am going to require that you have one.” Switching gears quickly, they worked with the fire district and developed a plan which would allow them to use several structures as opposed to one. “It wasn’t the ideal situation that we hoped for, but we found a way to make it work.” says Chris. Since 2003, they have been operating The Asylum at the same location. 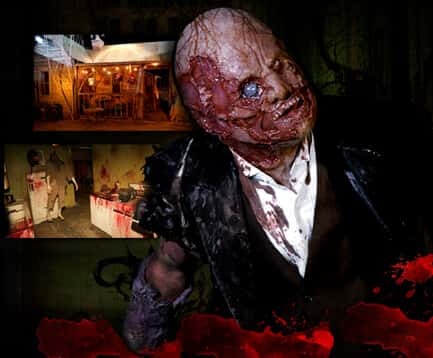 Through successful marketing strategies and delivering what their customers want, they have built The Asylum into one of the most well known and well attende d haunted houses in Denver, a crowded market that on some years has had as many as 25 haunted houses within a 30 minute radius. Chris explains, “Denver is an island in the west, there are no major cities within even a 7 hour drive and the majority of the population in the state is within the Denver metro area. We really had to think about what was going to make us different, what was going to make people drive past several other haunted houses to go to ours.” Their answer in part was focusing on giving the customer what they wanted. “I really believe that people go to a haunted house to be scared. It’s ok to have elaborate sets, complex story lines and themes, but if you can’t make people jump, you’ve missed the mark. Don’t get me wrong, by adding the other components to your show, you deliver a complete package that expands your customer base. Although I believe the majority may be looking for a scare, everyone has something different that they enjoy in a haunted house.” Warren adds, “Sometimes, people design their attractions based on self reference criteria. They build what they might enjoy and loose sight of what the customer is looking for.” The Asylum has consistently been rated one of the top attractions in Denver, and in 2007 was featured on Travel Channel’s America’s Scariest Halloween Attractions. Fast forward to 2007. It was while visiting a local vendor for The Asylum when they drove by the building that would become the home of 13th Floor Haunted House. There was a sign in front of the building that said "Paintball" on it. Chris and Warren were curious, and decided to stop. They walked in and were immediately met by the manager of the facility. They inquired about the offerings at the field and the manager responded that if they wanted to play at the field, they needed to do it quick, as they would be moving within the month. “I took a look around and thought, large open warehouse, fully sprinkled…this is it!” Chris contacted the building owner, and after nearly a year of negotiation they came to terms on a lease for the building. In October of 2008, 13th Floor Haunted House opened its doors at a new permanent location. They finally had a year round facility where they could begin to really explore some different ideas that weren’t feasible in the temporary setup they had with The Asylum. But with the new experience, came yet again, more new learning opportunities. Chris says, “I’ll never forget opening night at 13th Floor our first season, the butterflies in my stomach were intense.” They were intense for two reasons, first because for the first time they were not working together, Warren was at The Asylum and Chris was at 13th Floor, and second, because as Chris describes he walked out of the front of the haunted house at 7pm, opening time and there were only 3 people there. “I remember thinking, what have we done wrong?” By 8:30 that night 13th Floor was rocking. The years of planning, promoting, and making educated decisions had paid off. 13th Floor, over the past two seasons, has fast become the most popular haunted house in Denver. Within hours they went and looked at the building, within days, they came to terms on the building. Chris reflects, “It’s kind of weird being here. We didn’t decide on this building because it was the old Brutal Planet, but because the same things that made it a great location years ago, still make it a great location today.” The building is located on the fringe of Denver’s lower downtown, the entertainment and nightlife district, just a half mile down the road from Coors Field. “It is surreal though, all these years later, we start the next chapter in our business in this building. Like I said, if you can see it, and you commit to it, one day it could become a reality.“ This October, on what may likely be another cool, foggy, rainy night in Denver, the 13th Floor Haunted House will open for business at their new location and Chris and Warren will continue on their “frightful” journey. A visit to the 13th Floor Haunted House begins first with a trip through a secondary attraction, Blood Shed. Described as an experience in hillbilly horror, you travel through the run down farmhouse and meet the “family." Out through the back yard and in to the “Blood” Shed before returning back to the farmhouse to visit the family for one last scream! Provided you make it out of Blood Shed with all your limbs attached, you then enter the arena queue for 13th Floor. Heart pumping beats play on the sound system and several different performers appear on stage. There’s an aerialist a la Cirque du Soliel, a fire and light dancer, and various creepy go-go dancers that keep you entertained while you wait to board the elevator that will take you to the 13th Floor. Visitors learn where the mysterious 13th Floor is located, that it would be too obvious to locate these missing floors above ground, where they would be seen between the 12th and 14th Floor, that instead these secret 13th Floor locations are hidden deep underground. You enter through a broken cinderblock wall which appears to be hiding a much older, secret passageway to a freight elevator. You’re rushed inside the elevator by one of the safety workers who had agreed, against all warnings, to take you to the 13th floor. After an intense ride, you arrive on the 13th Floor and begin to make your way through what appears to be some sort of catacombs of untold phenomenon. It is dark and damp, with old clay brick and partially rotted timbers overhead. The set decoration here sells the illusion that you have left reality completely. At the end of the tunnel you come face to face with a giant spear-wielding monster, who has evidently already claimed at least one victim. 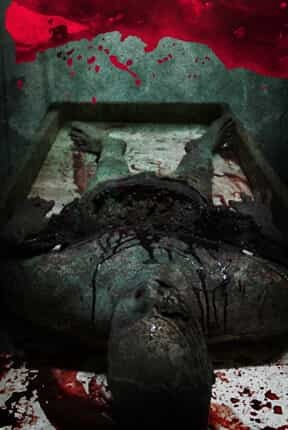 Over an open elevator shaft, through a storage area that houses everything from barrels of infectious waste to horribly mutilated and somewhat frozen bodies. Several disturbing scenes later, you end up in a maze where passages that seem like the right ways to go are impossible to pass. You then discover that several types of critters and creepy crawlies have infested the 13th Floor, snakes, rats and spiders, some of the giant variety! What haunted house would be complete without the clowns? 13th Floor certainly has some twisted variations of them lying in wait for your arrival. The next few rooms will leave you wondering if it was real or an illusion. One plays with your sense of balance, the next gives you a feeling of vertigo, and finally you face your fear of heights. You then travel through a shop, passing by a huge antique truck and then down a corridor, which looks like it’s collapsing on you. The next set of rooms has some great startles, including one that takes you quickly from one emotion to the opposite. Finally you tunnel to the exit, to safety, you think, before you’re hit with one last scare! Whether it is supernatural, government cover-ups or parallel universes, anything that you expect could be located on missing 13th floors is explored. The actors are amazing, from creepy to terrifying. 13th Floor utilizes it’s own in house effects artists, to create custom masks and appliances from silicone and foam latex, ensuring that you won’t see any store bought masks here. The 13th Floor is filled with lots of characters and creatures; some massive that appear to attack you from out of nowhere. A terrifying but exhilarating experience that is sure to get the endorphins pumping. Written by Audrey Grey, Audrey is a freelance writer and reluctant haunted house fan living in Denver, Colorado.